Every teenage girl has a dream of sitting next to a cute guy on a plane and falling in love before you land, right? I know that every time I get on a plane, I'm hoping for a good looking boy my age instead of a crusty old man who sneezes the entire flight or a person who really should have bought your seat too, because they keep spilling over…The Statistical Probability of Love at First Sight is that dream on paper. I wasn't expecting anything too literary when I picked this book up. I thought it would just be a fun and silly read that I could use to stop thinking about my school work over the weekend, but I surprised myself when I couldn't put it down. I started reading it in the bookstore when I picked it up as part of a 3 for 2 deal, the other two being books I desperately wanted, and this as the "looks cute and it's free" pick, and by the time I left the bookstore I was sixty pages into it with no drive to stop reading other than my stomach yelling at me to put food in it. Hadley, the main character, is a 16 year old girl who could come off as annoying because she complains about missing her flight to London, complains about how her dad left her mum, complains about her dad getting remarried to someone she has never met…but, I didn't find her annoying, I actually found her very relatable and real as a character. She wasn't gracious about the negative changes in her life and she wasn't overly dramatic about how much she hated them. I found her to be a refreshing character who seemed very real in her emotions and her personality. I loved the boy that she met in the airport after reading the second sentence about him. It didn't take long at all to picture Oliver and swoon (on the inside) at the cute or funny things he said. Although I did find myself slightly annoyed by his jokes and attempts to be mysterious at times (like his pretend research projects), overall I thought he was pretty great. I have thankfully never dealt with parents getting divorced, and hopefully never will, but I did find Jennifer E. Smith's portrayal of Hadley's family to be believable. Hadley's rift from her parents was well written, and it added an interesting layer to a story that would have just been cheesy if it ended with two teenagers meeting on a plane and falling in love at first sight. One thing that I didn't like, but I understood as part of a story that was supposed to be a whirlwind adventure, was that the majority of the book happened on one day. The story felt rushed and like it ended too quickly for my liking. Instead of ending the story with the end of Hadley's trip to London, the story ends on her first day there, the same day that she was on the plane. To be more believable and satisfying, I would have liked the story to end with the plane ride home. 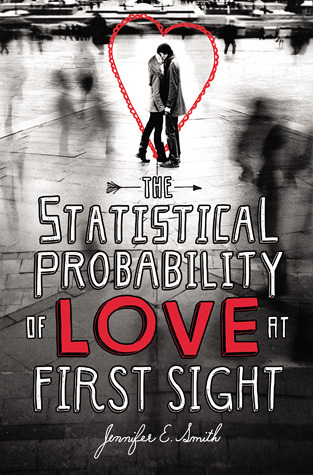 Overall, I found The Statistical Probability of Love at First Sight to be cute and an easy read for a cold January afternoon. I would recommend it to anyone who wanted to relax and curl up with a book that didn't require much thought and was easy to get through. I would give the book 3.5 stars. New URL and New Name!